Paul HURMUZ joined the Military High School in 1976 and the Military Academy in 1980. In 1983 he was commissioned as a Second Lieutenant. During his military career, he served in different operational units before attending the Romanian Staff College and later the National Defence College in Bucharest.He was also appointed in Defence Diplomacy positions in Ankara (Turkey) and London (UK). As Defence Attaché in London, he represented the Romanian MOD in different formats during Iraq, Afghanistan and Balkans Operations. 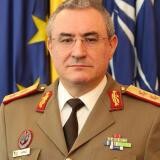 Before joining NATO HQ in September 2013, he served as the Head of Plan, Policy and International Cooperation in the Romanian Military Intelligence Directorate. He was promoted to the rank of Brigadier General on 1st December 2013. In his capacity as Deputy Director of the Intelligence Division of the NATO International Military Staff, Paul HURMUZ was also the Joint Intelligence Surveillance and Reconnaissance Senior Military Coordinator and the Chairman of NATO Geospatial Board. On 2nd September 2016, at the end of his NATO HQ tour, he was appointed as Deputy Chief of the Defence Policy and Planning Department of the Romanian Ministry of National Defence and on 1st December 2016 he was promoted to Major General.